Sage approached Parker Design to create a direct marketing template for the SageOne campaign. As part of the SageOne campaign, our client would form partnerships with accountancy practices who had recommended the product to their clients as their preferred accounting tool. As well as featuring the benefits of SageOne, the template needed to be adaptable and incorporate a logo and contact details from the accountancy practice. 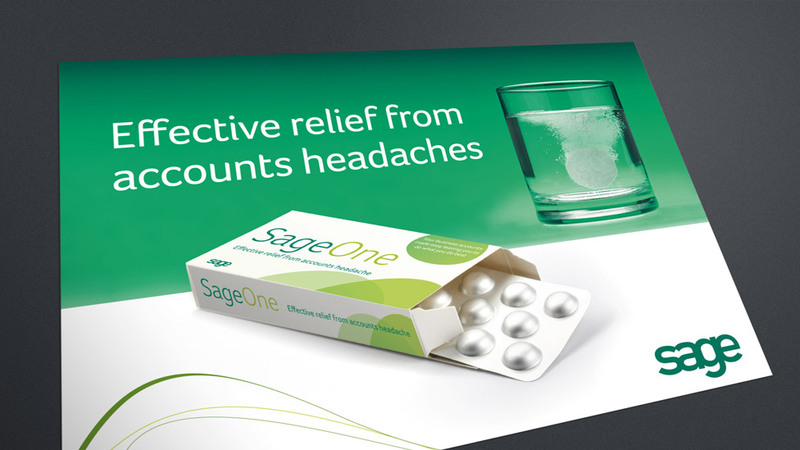 The direct marketing template featured the already successful ‘effective relief from accounts headaches’ design concept, which Parker Design had previously created for the overall SageOne campaign. When the first partnership was formed we were able to print and deliver the template within a couple of days of being given a call from the client. We have delivered many successful projects for Sage over the years, have a look here. “I was delighted working with Parker Design. The team work in a very intuitive and thorough way, delivering to very tight timescales.